The first time I did an organisational design project was for the Sales & Marketing function of an Automotive Company in South Africa in the nineties. As part of that prep, I studied our methodology and for the first time, came across the accountability framework for determining who is Accountable (A) for an activity or decision together with who needs to be Consulted (C) or Informed (I) and who is Responsible (R) -> The RACI framework. What is the difference between being Accountable or Responsible? How important was it to really define who needed to be Consulted and Informed? What about other people who needed to be involved in actually doing the work? 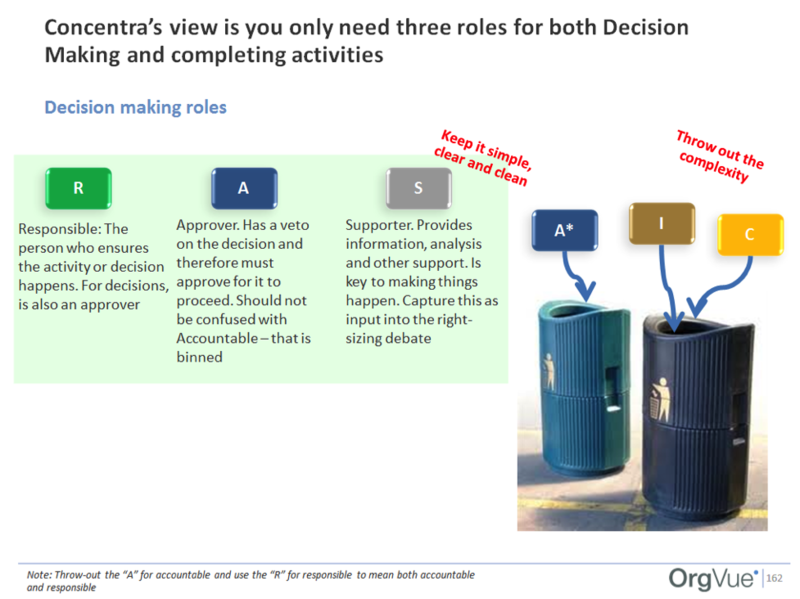 Making decisions is different to doing “stuff” – what about all those who have a veto on a decision or feel they do? What I didn’t think of until much later, but after having done this numerous times since, is once this has been defined, how do you sustain it? How do you communicate it? How do you make it live? Too often we define things like a “RACI” as a one-off and people make a big fuss about whether they are consulted before a decision is made or informed after it is made. So, I did the project in South Africa. We successfully created a new organisation with clear processes and clarity on who was responsible for what. From this point onward for many years, whenever I did an org piece, the good old RACI or RASIC (the S stands for “Support”, i.e. who else needs to actually do something) was always a fundamental framework, but all those questions above remained. I got tired at trying to explain the difference, in particular, between R & A. The “R” needs to make sure it happens; The “A” gets “shot” if it doesn’t. Yes, they are often the same person… Equally, having debates around who exactly needs to be informed or consulted is fairly painful. You really know you are on a losing wicket if you debate that one for hours. Shouldn’t the person responsible also be responsible for working that one out? Shouldn’t we just say that the R&A is the same person? If it is a decision, should we need to know who needs to approve it – i.e. who has a veto? From a workforce planning perspective, isn’t it important to know who needs to be involved? This leads to a “RAS” framework. Equally, in OrgVue we enable you to define this link through a grid that feels very similar to that in Excel (download the OrgVue brochure here). More importantly, however, once defined everyone can see who is responsible for what within the org charts. As I often say, it is more important to define what is in the box rather than where the box sits. “High-quality decision making and strong performance go hand in hand. Yet, in many companies, even clear, well framed decisions can be derailed by uncertainty over roles and responsibilities. There is no right or wrong framework, but it’s best to avoid complexity. Whatever framework you choose, OrgVue can help you configure the links between people and tasks to accommodate your preferred framework.